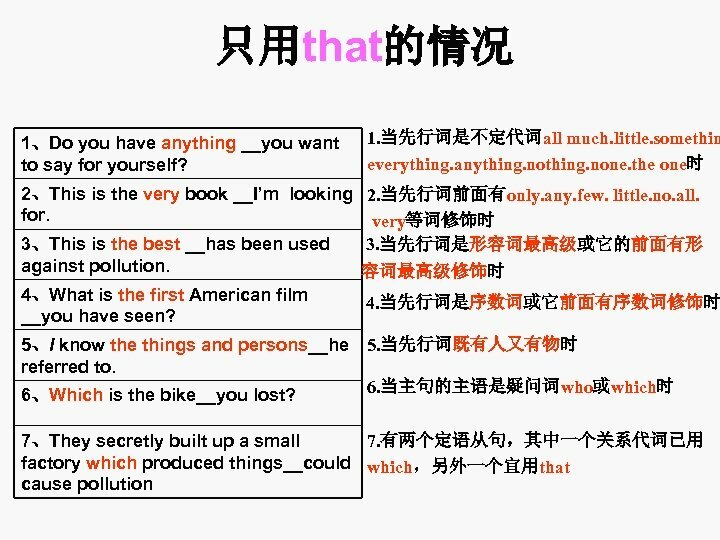 定语从句的特点 ¡ 定语从句修饰主句的主语、宾语、表语，所 以去掉定语从句后主句仍然完整。 Do you know the man who spoke just now? Do you know the man? He spoke just now. 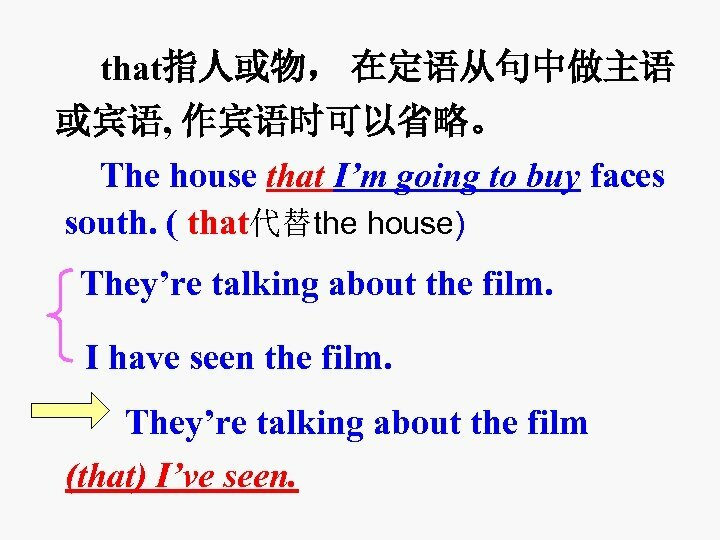 that指人或物， 在定语从句中做主语 或宾语, 作宾语时可以省略。 The house that I’m going to buy faces south. ( that代替the house) They’re talking about the film. I have seen the film. They’re talking about the film (that) I’ve seen. Who 指人，在从句中可做主语和宾 语。作宾语时可省略。 The man who is shaking hands with my father is a policeman. 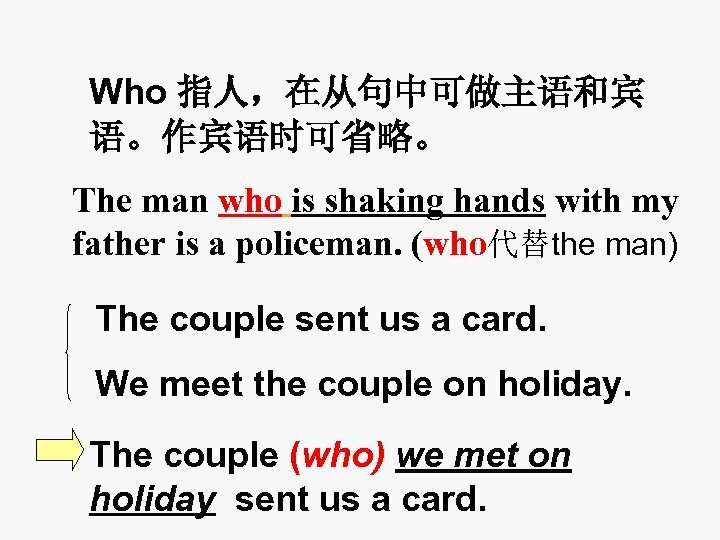 (who代替the man) The couple sent us a card. We meet the couple on holiday. The couple (who) we met on holiday sent us a card. 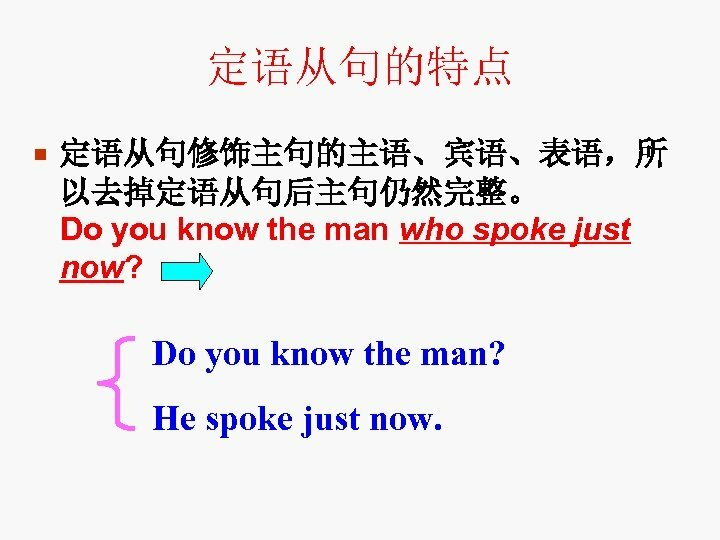 whom指人, 在从句中作宾语, 可省略。 e. g. Do you know the man (whom) we saw at the Beijing Hotel? 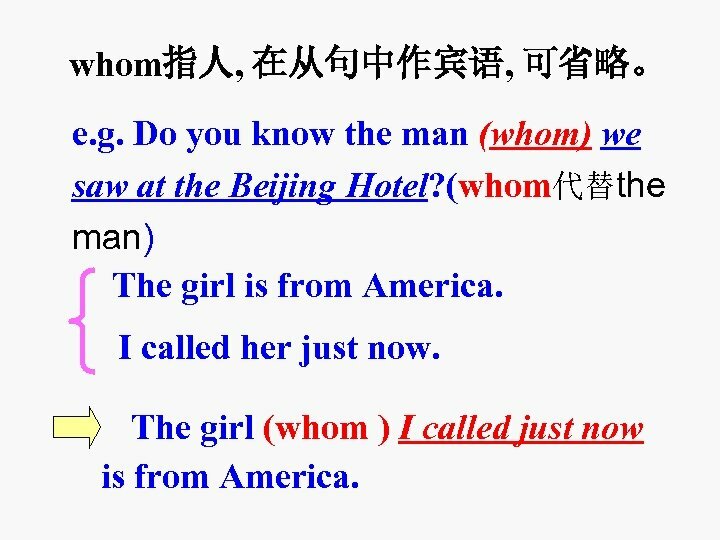 (whom代替the man) The girl is from America. I called her just now. The girl (whom ) I called just now is from America. I have read the newspaper. It carries the important news. I have read the newspaper which carries the important news. 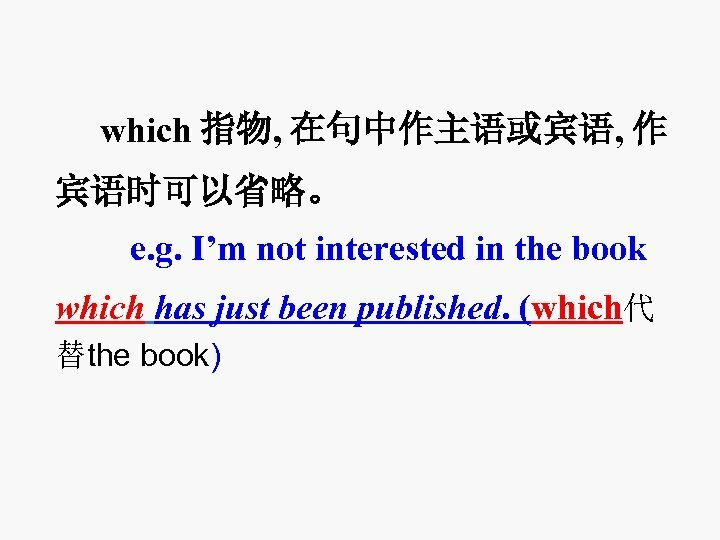 * whose 指人或物，在从句中作定语。 eg. That’s the man whose house was burned down. 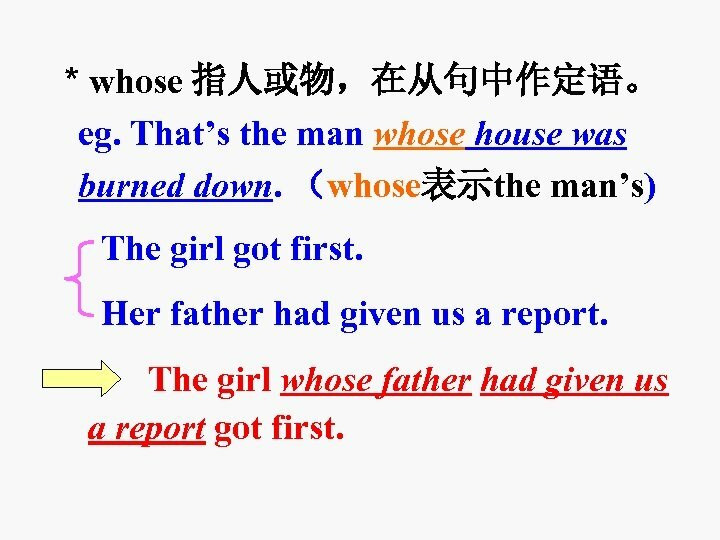 （whose表示the man’s) The girl got first. Her father had given us a report. The girl whose father had given us a report got first. I once lived in the house whose roof has fallen in. 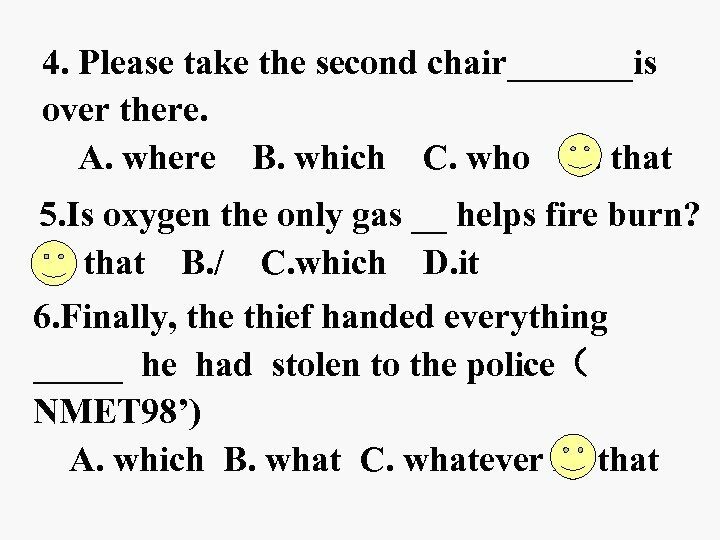 注意：指物时，常用下列结构来代替： The classroom whose door is broken will soon be repaired. 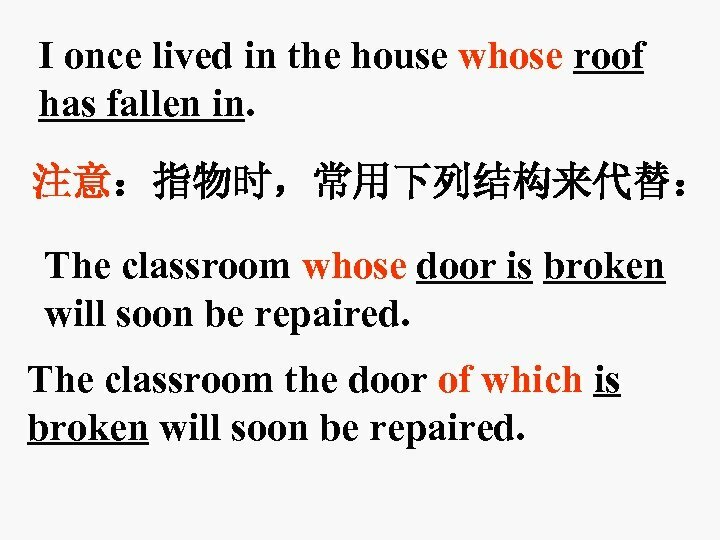 The classroom the door of which is broken will soon be repaired. 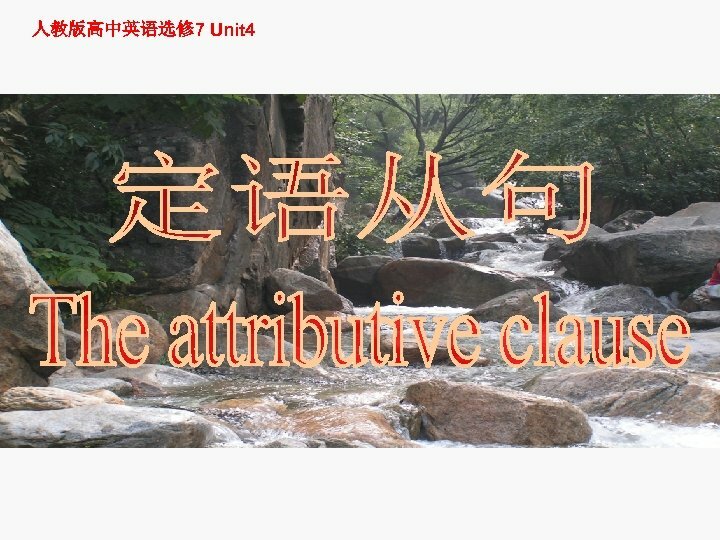 几种易混的情况 1. I’ll never forget the days _______ we worked together. 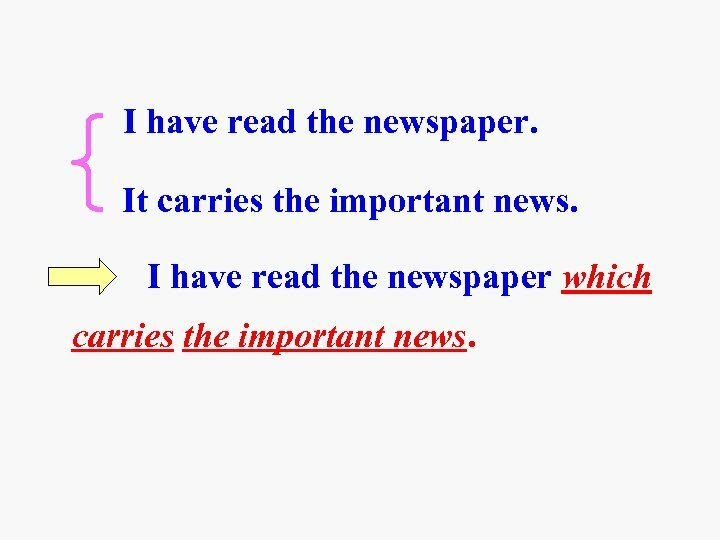 when /in which 2. 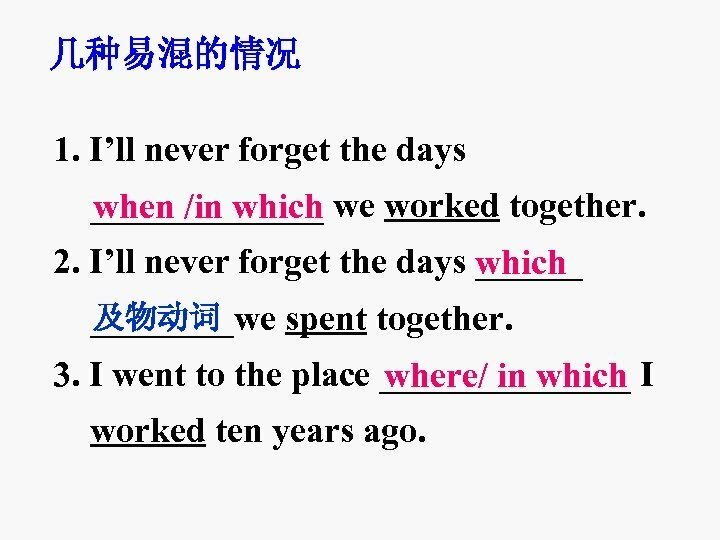 I’ll never forget the days ______ which 及物动词 ____we spent together. 3. I went to the place _______ I where/ in which worked ten years ago. 4. I went to the place _______ I which 及物动词 visited ten years ago. 5. 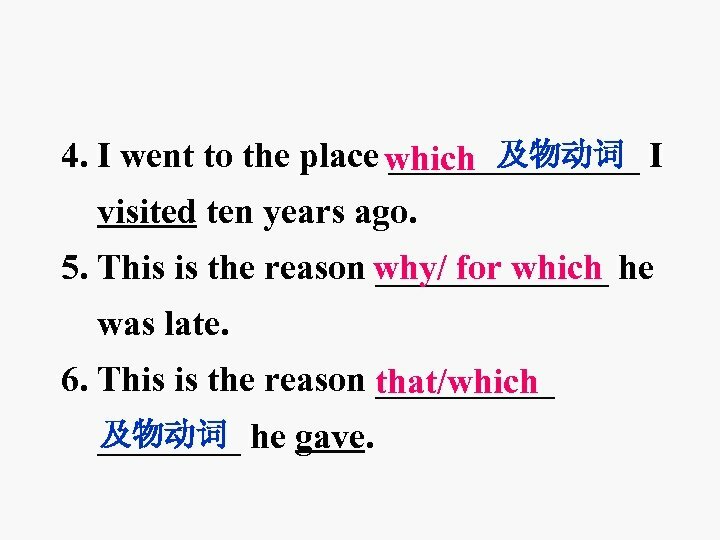 This is the reason _______ he why/ for which was late. 6. 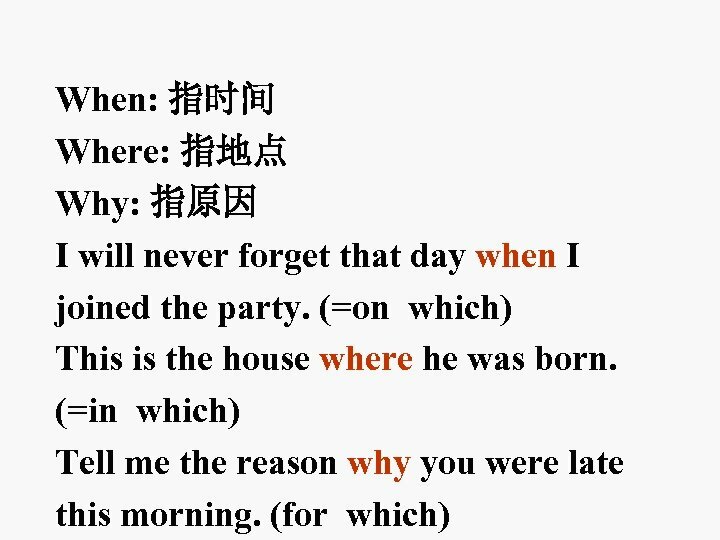 This is the reason _____ that/which 及物动词 ____ he gave. that 6. Tom is the first boy _____left the room. 7. Look at the boy and his dog _____are that coming this way. 8. You can read any book _____I have. that 9. That was the year _____I went to when America. 10. We came to the town, ______we stayed where for 2 hours. 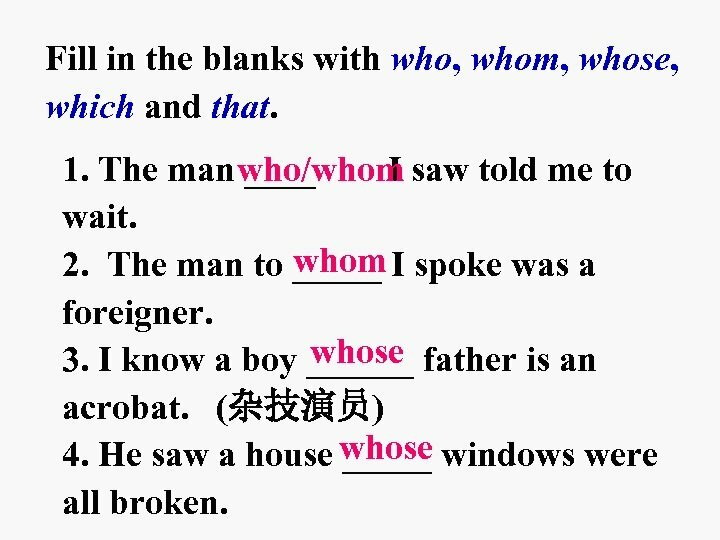 Fill in the blanks with who, whom, whose, which and that. 1. The man ____ I saw told me to who/whom wait. 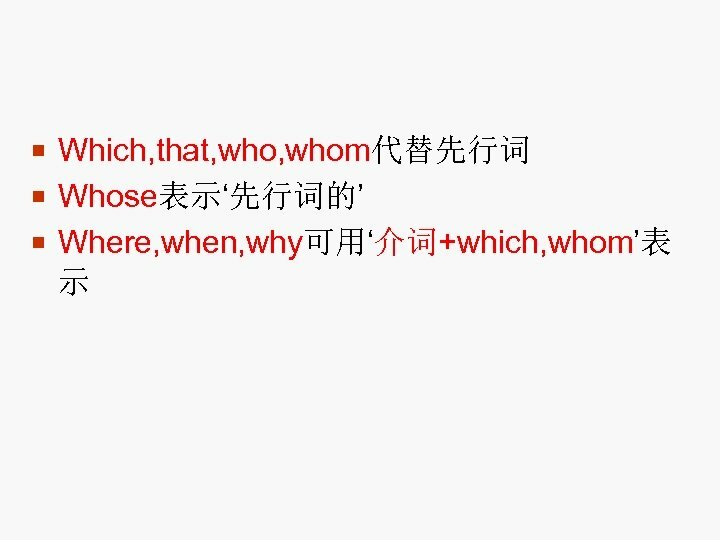 whom 2. 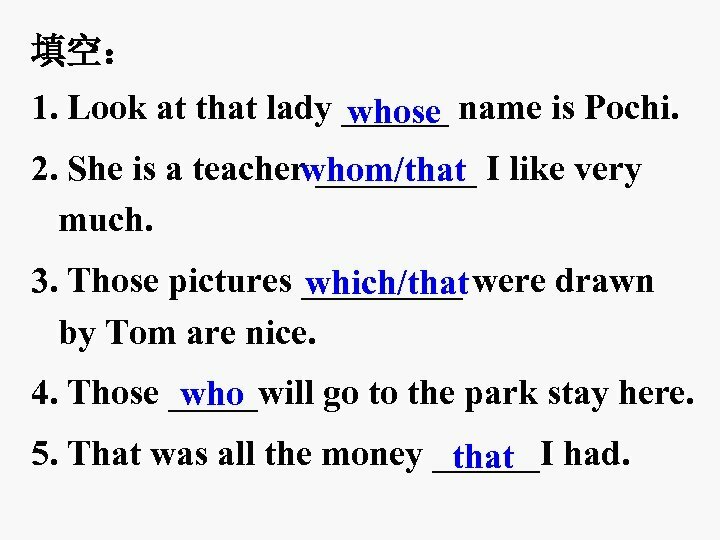 The man to _____ I spoke was a foreigner. whose 3. I know a boy ______ father is an acrobat. 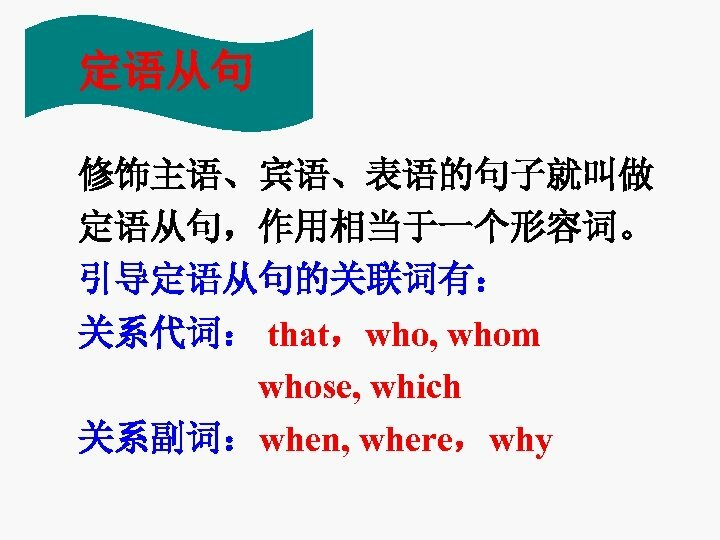 (杂技演员) whose 4. He saw a house _____ windows were all broken. 5. 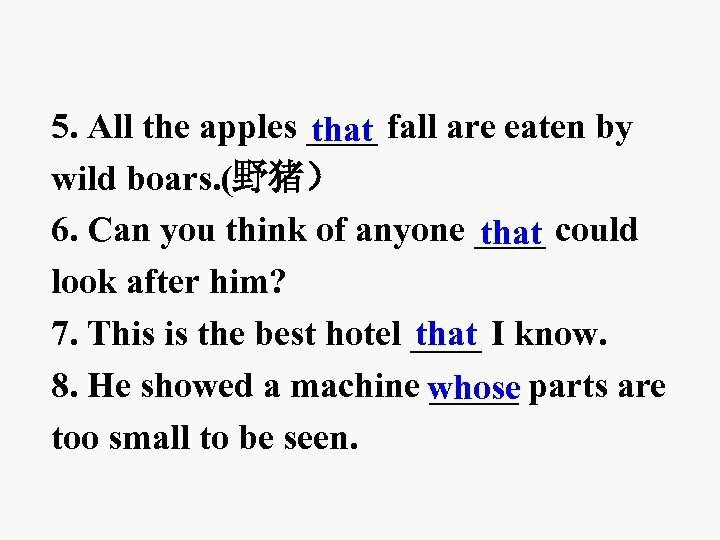 All the apples ____ fall are eaten by that wild boars. (野猪） 6. Can you think of anyone ____ could that look after him? 7. This is the best hotel ____ I know. that 8. He showed a machine _____ parts are whose too small to be seen. 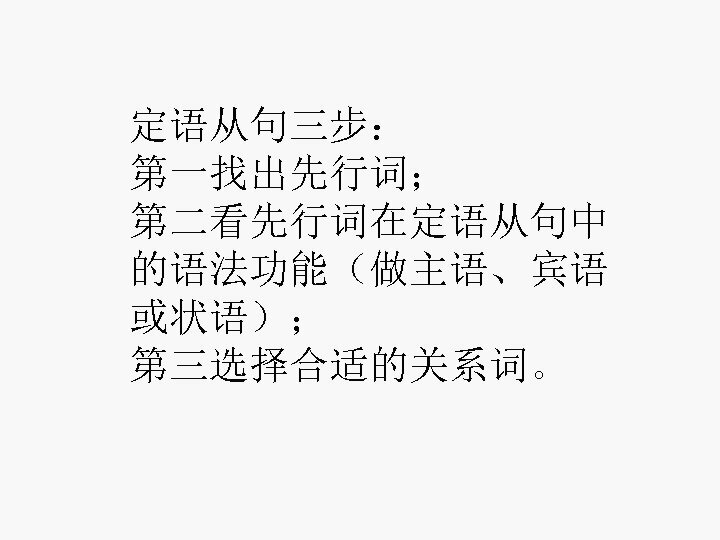 翻译 1. 他指给我看他丢钱包的地方。 He showed me the place where he lost his wallet. 2. 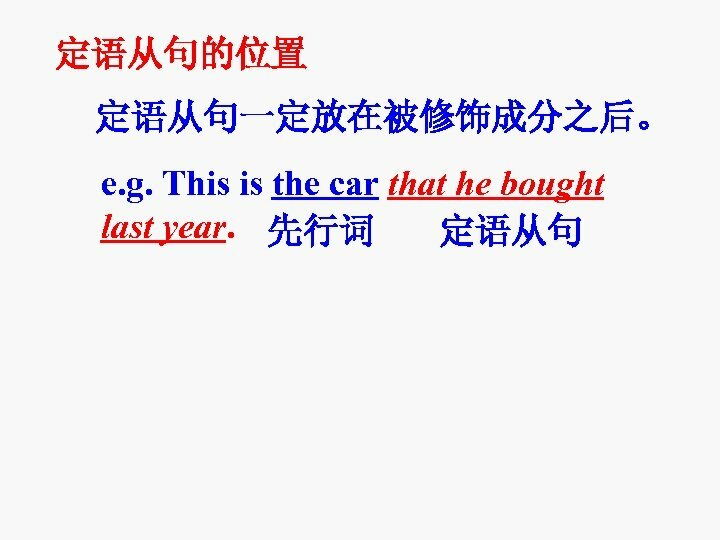 我不认识那个和你说话的女孩。 I don’t know the girl whom/that you speak to. 3. 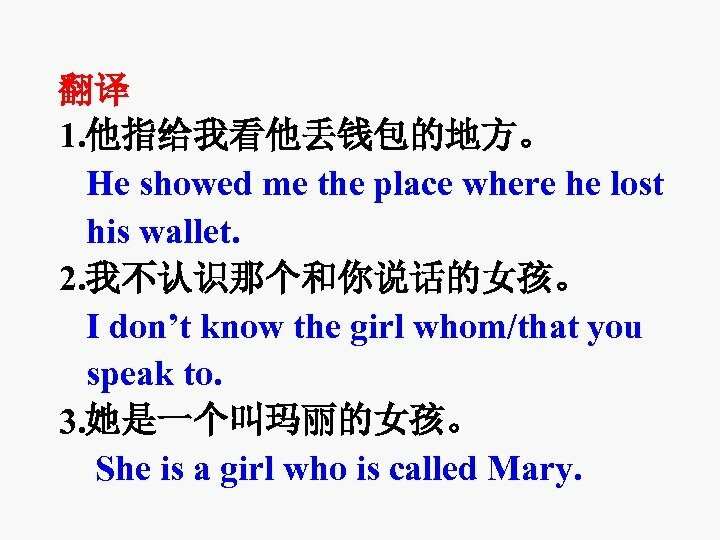 她是一个叫玛丽的女孩。 She is a girl who is called Mary. 4. 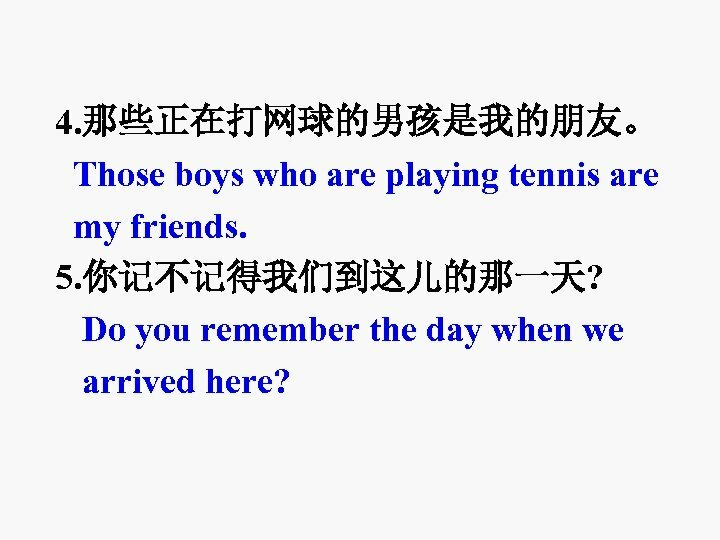 那些正在打网球的男孩是我的朋友。 Those boys who are playing tennis are my friends. 5. 你记不记得我们到这儿的那一天? Do you remember the day when we arrived here?